Many different types of cells use actin filaments to generate tensional forces and to exert traction forces on their adhesions and linked ECM (or other cells); these processes cause resting tensile force (reviewed in ). Local stress or force differences that occur both internally and externally are transduced through the actin filaments and focused onto mechanosensors throughout the interlinked system rather than being limited to local deformation (reviewed in ); this process leads to mechanotransduction events that influence the cell shape and/or motility (reviewed in ). 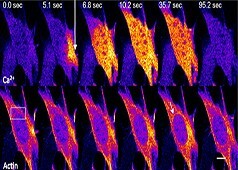 Cells exert traction forces on the ECM and generate tension at focal adhesions through actin stress fibers, which are higher-order structures in the cytoplasm that consist of parallel contractile bundles of actin and myosin filaments. 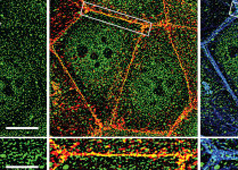 Stress fibers are linked at their ends to the ECM through focal adhesion complexes. 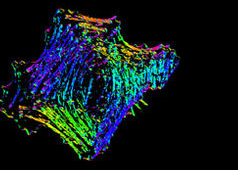 Cell tension is generated along the actin filaments by the movement of myosin II motor proteins along the filaments (see contractile bundles). The elasticity of the actin network appears to be inherent to actin filaments and is independent of myosin II motor activity . 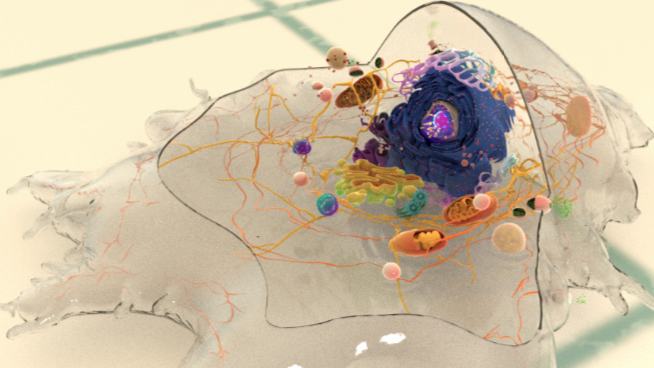 Forces produced by the contraction of stress fibers not only helps the cell body to translocate during migration  , but they also serve as a vital “inside-out? feedback system to regulate actin filament initiation , cell growth and motility , and formation/maturation of focal adhesion complexes . Forces produced by stress fibers also stabilize the cell structure and contribute to establishing the cell polarity  and they help determine the cell fate . There is no evidence that forces influence stress fiber contractile activity by increasing the exchange of ADP for ATP on myosin, however, force can weakly increase the release of the myosin heads from the actin filaments (reviewed in ).